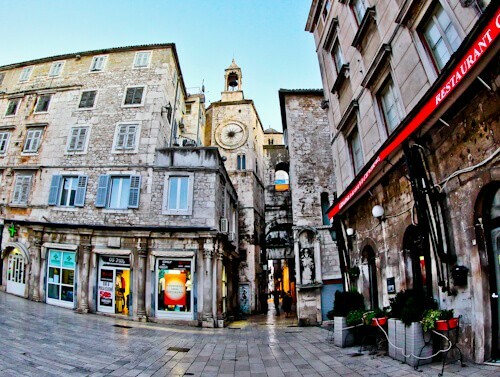 I was staying at Guesthouse Vujevic which is a 20 minute walk from Diocletian’s Palace. 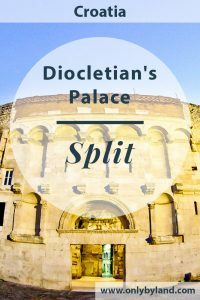 It’s important before visiting the palace to know who Diocletian is and why did he have such a huge palace? 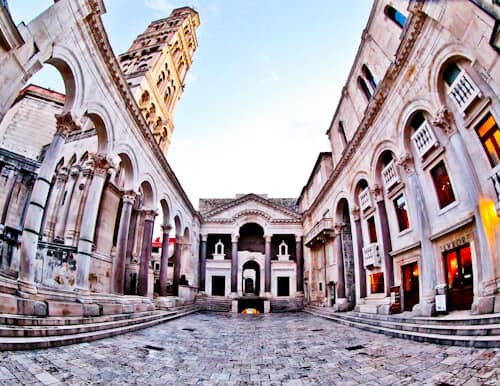 Diocletian was a Roman emperor which gave him the power to build this elaborate palace. The palace was built at the start of the 4th century. To see the enormity of the palace it’s best viewed from the other side of the bay of Split. Alternatively you can ascend the campanile for an aerial view. The central square of the palace is the Peristyle courtyard. An interesting point of interest of the courtyard is the Sphinx statue which is over 3500 years old. Additionally, the dark columns surrounding the square came from Egypt. Other points of interest around the square include the campanile of the Saint Domnius Cathedral as well as the entrance to the underground cellars. 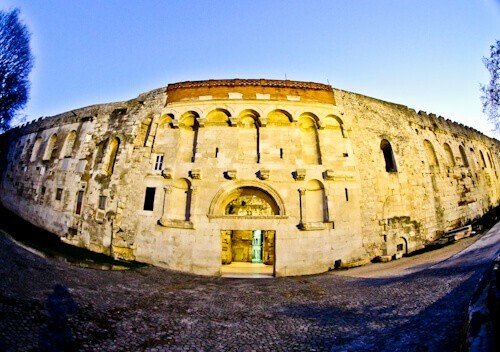 If you enter Diocletian’s Palace through the Southern Gate (Bronze Gate), it passes through cellars. The cellar is a Game of Thrones filming location and not to be missed by fans of the series. There are several market stalls selling interesting souvenirs in the cellars which of course include Game of Thrones merchandise. Furthermore, above the cellars is the Vestibule which was the entrance for important guests. Nowadays the Vestibule is home to buskers playing live music. As a result of the unique building style it’s said that music played here sounds different, perhaps better! The Saint Domnius Cathedral is unique in shape as it was in fact the Mausoleum of Diocletian. His body has been removed and destroyed but no-one knows exactly what happened to it. You may enter the church and photograph inside but must respect anyone praying. In addition, for a small fee you may ascend the campanile bell tower for an aerial view of the palace, I highly recommend this if you are a photographer. The campanile is of similar style to that of nearby Trogir. Located close to the Peristyle is the Temple of Jupiter which is identifiable by the headless Egyptian Sphinx outside. Diocletian believed that Jupiter was his divine father, for this reason there is a Temple of Jupiter in the palace. Nowadays the temple is the Baptistery of Saint John the Baptist. The northern gate to the palace is known as the Golden Gate. In fact it was originally known as Porta septemtrionalis during the era of Diocletian. 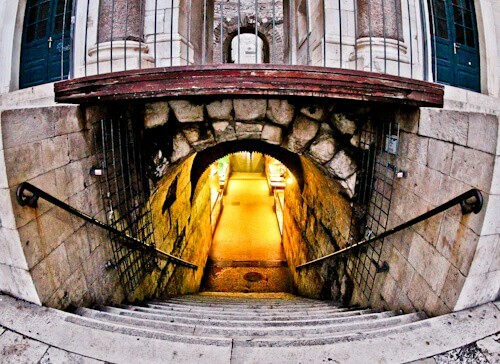 This entrance was used solely by Diocletian and his family, it was forbidden for anyone else to use it. Nowadays anyone may use this entrance and if you walk straight forward from this entrance it leads you to the central square, the Peristyle. The eastern gate is known as the Silver Gate. During the era of Diocletian they were called the Porta orientalis. 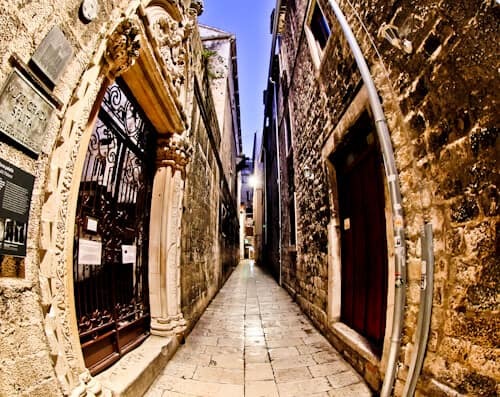 Although the gate has been restored, the path you walk on is the original one from the era of Diocletian. Furthermore, on the outside of the Silver Gate is a small tower which gives some idea of how grand it once was. A notable event here in the year 2000 was when Pope John Paul II walked through the Silver Gate. The Iron Gate is where new meets old. 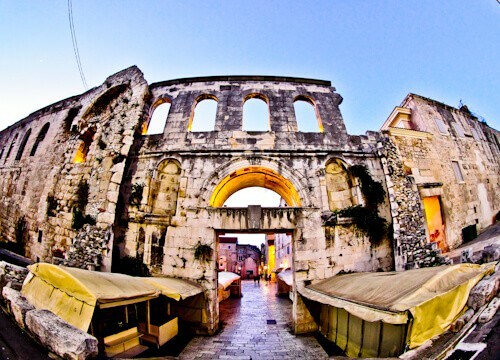 As the Diocletian’s Palace is located in the center of Split, it actually joins onto the newer part of old town here. In fact there is a Romanesque bell tower at the gate. Additionally, outside the Iron Gate is Pjaca square. Here you’ll find a few cafes which are perfect to sit out at and enjoy a drink. You could however, sit in front of the palace and enjoy the beautiful Split sunset. 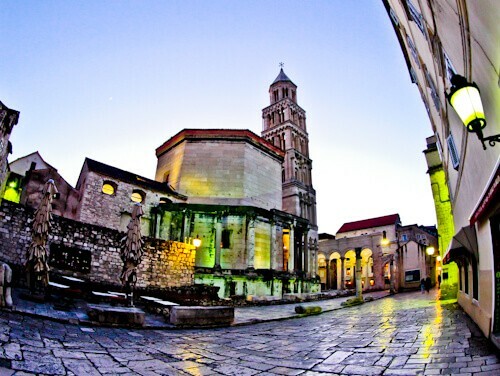 Diocletian’s Palace is part of the old town of Split therefore people are living in it. In addition there are shops, cafes, restaurants, hotels as well as people going about their daily business. It’s definitely worth walking around aimlessly, who knows maybe you’ll recognise parts of it from Game of Thrones! Make sure you visit the points of interest of the palace, especially the top of the campanile for an aerial view. Additionally you’ll be rewarded with unique sites when you explore the narrow streets of the palace. Enjoy this your complimentary visit to this UNESCO world heritage site, 4th century palace and Game of Thrones filming location. Read about what to see in Split Croatia, take the Hajduk Split stadium tour as well as a day trip to Trogir. It’s absolutely true that a traveler can become so well informed about places. You must have done a lot of research to write about this place. This UNESCO site is worth a visit, I’m sure. My son came here briefly in 2013, but did not scout Diocletian’s Palace as closely as you did. Thank you for the facts and information. If I come here, it would be as if I’d stepped on it beforehand and the trio would be like a second journey. The first one is through this article, which is like a time machine. All we need to do now is learn how to pronounce Diocletian – I’m sure it’s pronounced with a Yorkshire accent!